I must have been hungry when I decided to write about food today. 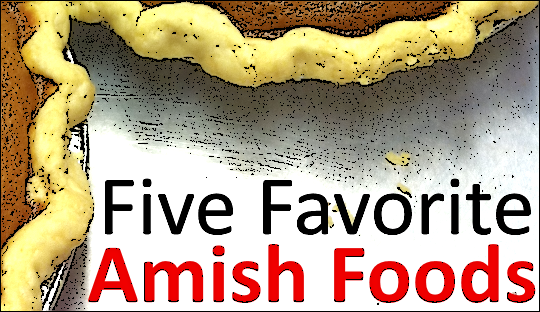 Below you’ll find a list of my five favorite Amish foods, and why I enjoy them. Would any of these make your list? Now, we can debate what makes a food “Amish” or not. That’s not really the point of this post though. I’m using the term to describe foods I’ve eaten with Amish friends multiple times, or that they are otherwise associated with. So, here is my culinary wish list when I visit the Amish. I don’t always get all of these every time I visit, but if I get one or two I’m pretty happy. Hat tip: Reader Kendall for getting me thinking “food” on our suggestions post. I’m not picking a flavor here, but choosing pie as its own category. Pie is my favorite Amish-made dessert. I love just about every kind. That’s not to say every pie I’ve had in Amish communities is equally commendable. In fact, I was pretty disappointed by a pie I picked up at one Lancaster County stand a few years ago. But most of the time you will do well with pies the Amish bake and sell at stands and bakeries, so go with positive expectations. Not on the list: Shoofly pie. Probably the most famous of the “Amish” pies. I’m not a big fan, though I don’t mind it warmed up and with cold milk poured on top. Thinking it just needed some tweaking, I tried a chocolate shoofly pie on my last trip to PA. Didn’t do much for me. Would anyone out there say they love shoofly pie? Also–and I know they’re not the same sort of “pie”–but whoopie pies I usually avoid. I enjoy the first 2-3 bites. Then it gets too sweet. If you are like me and feel the first meal is potentially be the best meal of the day, the breakfast casserole may be the ultimate choice if you only get to choose one breakfast food. The best I’ve ever had may have been the one that Amish friends made when they were visiting my family in NC a few years ago. Unless they had some supplies I’m forgetting, they used our regular English grocery ingredients to make it. So it’s not like they had access to all the farm-fresh wholesome this-and-that. They must have the magic touch. I don’t even know exactly what went in there. Eggs, meat, cheese, something sweet (syrup? ), whatever it was, it all came together in perfect harmony. One caveat: you really need to be as active as an Amish farmer to eat this every day. Are you detecting a pattern? You’re not seeing organic celery sticks or any other rabbit food on this list. These are all calorie bombs, which is why I always recommend pausing or postponing the diet if you’re planning to visit the Amish. I memorably had homemade donuts a few years ago on my birthday, which happened to land on the birthday of an Amish friend. The family had gathered that day to fry donuts, which they did in a bit vat of oil. They stuffed them for good measure, with chocolate and creme filling. A good fresh homemade donut is hard to beat. We’ve discussed it before, but I’m still not sure if donuts are a dessert or a breakfast food. Call it a hybrid? I’ve brought up this treat a number of times already. Amish serve it at the fellowship meal after church service. It’s a combination of peanut butter, marshmallow creme, and some other stuff. It’s smooth and drippier than regular peanut butter, and also sweeter. I usually spread it on half a slice of bread, and on the other half spread another church staple, cheese spread. No particular reason, other than I like to mix. You can also get commercially-produced “Amish-style” peanut butter in jars. You might expect me to say that the church stuff is clearly superior. But I’m not going to. It probably has the edge, but I’ve had commercial Amish-style peanut butter that I thought was comparably good. It seems easier to find Amish peanut butter in stores in recent years. I’ve had these in Lancaster County, just a couple of times. Despite its name, a mountain pie is actually not a dessert. Close it, hold over the fire for a while, and a few minutes later you have a delicious hot sandwich. I include it here not just because it tastes good, but for the experience. I love fires and sitting around in the evening in the backyard. It’s also one of the only “Amish” foods I actually participate in making. Well, I think I need to go check the fridge now. And of course, I’m curious–what would you put on your list? Noodles, rhubarb pie and whoopie pies. Enough said, except YUM!!! eaten them. Wish I had one or more of them right now! Fried corn meal mush – several places in Elkhart/Lagrange Cos. Ind. Amish-made maple syrup — Orleans, Ind. 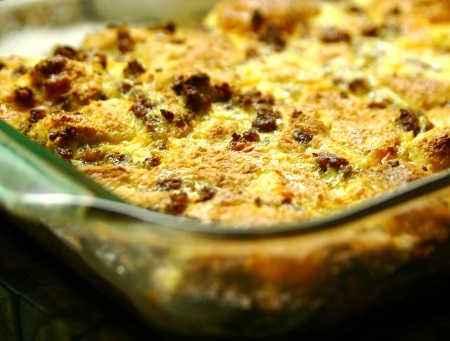 The Breakfast Casserole sounds appealing to me, I wonder though, can it be prepared the day before and kept over night? It sounds more appealing to me than my usual box cereal, berries, and a coffee for breakfast that basically I’ve been eating my entire life (though be fair, I do treat myself every once in a while and have bacon and eggs). I’d like to know if anyone else other than Erik has eaten the Breakfast Casserole, and how do you or your Amish friends prepare it? I make two different types of breakfast casserole. The one you are talking about is similar to this one: Beat 6 eggs, add ham, bacon or sausage, salt, pepper, 2C. milk and 6-8 pieces of bread cubed. Mix and refrigerate over night. Top with grated cheese and bake @ 350* for about 45 min. I find this is better as a left-over. Beside it being easy, this is another one of its perks! The other breakfast casserole I make, is a french toast casserole. Cube 6-8 pieces of bread and add 2 beaten eggs, 1 1/2 C milk, 1/4 c sugar, pinch of salt and 1/4 C. chocolate chips. Refrigerate over night. Bake @ 375* for 30 min. Egg Casserole - English family Christmas tradition! Yes you can prepare the evening before. Many years ago I tried an egg casserole recipe that I’d found in Taste of Home magazine. It has become our traditional Christmas brunch. Made some personal preference tweaks….. I don’t add the sausage but prepare our favorite pork roll as a side dish and because I don’t care for green peppers omit them too. Keeping the sausage and peppers out create a firmer texture. I’m thinking that adding some maple sausage links would be a delicious addition plus made some hash browns? Easy recipe to personalize for your tastes. I also prefer using stale bread to fresh, again going for a firmer texture. Yes, I’ve had it many times. However, it’s always a special holiday treat in our house and always on our breakfast table Christmas morning. I do make mine the night before, keep it in the fridge and then it bakes while we open our gifts. If we don’t have breakfast casserole, it’s not Christmas! I think I’d agree with Harriet, a good leftover food. This brings back memories . My parents were originally Amish from Big valley Pa. I had to learn to talk English to go to school . One of my favorites was every friday night we had bean noodle soup and moonpies .Noodles were homemade and dried great northern beans which were soaked overnight then all cooked together and moonpies made with our own dried apples . Now since I’m older and look back 50 years I really do miss it ! Will those are two classics in some communities aren’t they. When I read moonpies my automatic thought was the commercial chocolate-marshmallow things, but I think you mean the stuffed half-moon shape crust pies. I like those. Yes you are right . We just called them moon pies because we didn’t even know about the other stuff . But yes the are really half moon pies or in pa dutch muunboy . Yes muun is right for dutch it means moon and boy means pie ! To answer your question I have to say I love shoo fly pie!!! I think molasses runs in my blood… Aside from shoo fly I enjoy PA German apple tart, funnycake either the chocolate or lemon variety, strawberry custard, strawberry rhubarb custard, lemon strickle and lemon sponge pie. Aside from them I also enjoy sour cream raisin or funeral pie as its called. Growing up pie was served at least once a day if not more in our home. Mom was a wonderful baker. She’d bake once a month and crank out 20-25 pies: some breakfast pies, dessert pies and supper pies. It wasn’t anything too unusual to have an apple dumpling as a meal in itself either. You’ve really hit on very fond memories with this topic. Fry pies…This is a fairly new one for me. Attended an auction a couple years ago and had my first one and was hooked. These are not pudgy pies as #5 on the list is called. They are a hand held half moon pie filled with more of that commercial pie filling that comes in a pail, deep fried, and frosted with a light powdered sugar glaze. But, if you find a rhubarb one you know the filling is home made. The recipe I found had cake flour in the crust, so way better! I asked a lady at the auction about making them and she said, go to Walmart and buy a perogie maker! It’s on my bucket list! Ha! Amish Peanut Butter…I cut this recipe out of a magazine in 1996. Mix together and store in a covered container in the frig. Tomato gravy…Anyone have it? We stopped at our Amish friends and they were just sitting down to breakfast and it was on the menu. We were invited to join them, but declined. So, I don’t know if it was tasty or not! PS: Sorry Erik for writing a book again! Ha! No worries, your books here are always interesting Terry 🙂 I agree with you on pie as a food group. I’ve seen shoofly in non-Lancaster-origin communities but not too often. I think some non-shoofly areas might be making and selling it since tourists have heard of it and want to try it. My mom, who wasn’t raised Amish, but dad was, made Tomato gravy, and we had it over fried cornmeal mush (they call it polenta now), Hash browns, and when it was a real treat, we got scrapple with it.I really looked forward to this when we would get it. My sisters and I all make it now. I don’t very often make the tomato gravy, but do every once in a while will just to treat myself. One time I remember visiting my dad’s family in Kansas, and we were at an uncles house for breakfast. Beings I was 16 yrs. old, my eyes lit up when we started eating breakfast. By the time it was said and done, I think we just had polished off a seven course meal. I was in my comfort zone. I am very thankful for my Amish heritage. What I mean is, was it an authentic Amish bakery. There are lots of phony Amish businesses in Florida where I spend my winters. But of course there are a few legitimate ones too; Yoders Restaurant in Sarasota comes to mind. I’ve had pie from there and it’s to die for. The crust is flaky and tender and it is made on the premises by Amish Cooks. Now, In Wisconsin I have Amish friends, one of which who owns a bakery – that is attached to her home – and another who is an excellent baker (aren’t all Amish women excellent bakers?) who is kind enough to give me pies with the absolutely best crust imaginable along with other delightful baked items. I can guarantee that If pastries are really made by Amish ladies you’ll know it because they do not turn out “bad” pie crusts. Besides, the Amish would never try to sell anything that wasn’t perfect. In sum I’d advise you to check on the authenticity of the bakery where the offending pie was purchased. In Holmes County Hershberger’s Farm and Miller’s Bakery and possibly others are Amish owned. Others that are “English” owned, but have Amish bakers like Kauffman’s Bakery, Der Bake Oven and Dutchman’s. There’s probably others, too. Good morning Erik, Just when I got on the scale and discovered that I’m the lowest weight I’ve been in 37 years, I see this post … well I can savor with my eyes and mind … ha! ha! Anyway, you asked about shoofly pie and I must say that it’s my absolute favorite; ever since I was a child. I’ve made them, bought them and have ordered it in restaurants. Yes, some are better than others. The best I’ve had is served at a little Amish restaurant outside of Strasburg. It’s a very special treat for me these days. I have had some purchased in grocery stores and they tasted like cardboard … into the trash they went. The crust does set the tone for the pie! Shoofly pies made with molassas are the best. I’ve had them made with corn syrup and they are way too sweet! Mountain pies are very similar to something my mother made when I was a child. Even the utensil looks almost the same. It was called a Toast-Tite and popular in the 1950s. Instead of being square like the Mountain pie maker, it was round. Momma stuffed ours with cheese and sometimes added ham. When you closed the maker, you trimmed the bread crust and held it over the flame on the gas range. I still have that Toast-Tite maker but haven’t used it in years. Now one of my favorites that you didn’t mention is baked oatmeal. I have an authentic recipe passed to me by a friend’s Amish friend. The recipe makes a huge pan so I cut it in half. I also cut the sweetener, honey, in half. I like to sprinkle a bit of brown sugar and cinnamon on top before baking. Cut it and top with warm milk. A pan lasts for 4 or more breakfasts. It keeps well in the fridge. Just slice, place in a bowl, top with milk and microwave for about a minute. Especially delicious in the winter months. I also have a recipe for homemade granola from the same friend. It tastes more like a crushed peanut butter cookie and is delicious on yogurt. Hmmmm, I think that will be my lunch today! Congratulations Robin on weighing the least that you have in 37 years. It is not easy to do such a thing when we get, ahh … shall I just say “not as young as we used to be”? I don’t know how you can limit the foods to just five. I have never had a bad thing when in Ohio Amish country. As far as the peanut butter spread goes, I like the spread that the Blue Gate Restaurant sells in Shipshewana, IN. But the best of all is what an Amish friend of mine from Fredericksburg, OH makes. So good!!! It’s definitely not the place to visit if you are trying to lose weight…LOL Love that area! Last time I was in Shipshewana there is a little pie stand out side between Yoder’s store and the Red barn Markets. They sell all sorts of half moon fried pies. These are wonderful and after my first one, a cherry pie, I went back and bought over a dozen of them, all kinds. Gut bombs for sure but oh so tasty!! Breakfast Casseroles and other good stuff! My breakfast casserole is the same as Harriet’s, but I add shredded cheddar in with the eggs. Great even if left over. All my favorite recipes come from my Pennsylvania Dutch ancestors. Yesterday I made an apple crumb pie–delicious for dessert or for a breakfast treat. And my grandmother’s homemade noodles are so easy and so delicious. Just beat together three whole eggs and one yolk, add flour until it forms a dough, and let rest 20 minutes. Roll out on a very well floured board. Cover with clean towels and let dry for several hours. Then either roll up and cut in thin strips or cut in squares for pot pie as desired. Put in hot chicken stock and simmer for twenty minutes. And for a double dose of carbohydrates, serve over potatoes instead of gravy! I’m reading Sarah’s Gift right now! I didn’t think you could be the same Marta Perry, but sure enough…. I’m certainly a fan, though I just discovered your books. If you are eating your noodles over mashed potatoes, you must be from Indiana. It is my understanding that we are about the only place in the US that eats them that way!! YUM!!! Hi Harriet from Wisconsin, A friend of ours is from IN and they eat chicken noodle soup over mashed potatoes! That certainly is NOT a Wisconsin thing! lol! We’re in WI and do eat a chicken noodle soup over mashed potatoes but we picked it up from visitors from Indiana that stayed at our house for a conference, years ago. The family offered to cook dinner one night and that is what they made. It was kind of a thicker broth too, not like a watery thin chicken soup. I can’t list five, because I’ve had only two, very limited experiences. Both took place at the Carriage Crossing Restaurant in Yoder, KS. We drove up, both times from Mulvane, which takes about an hour. News travels far and wide when it comes to this restaurant. I had the chicken fried steak with mashed potatoes and green beans. I thought I’d died and gone to heaven, but I was so wrong. We got our pies to go because we were so full. I had mine for breakfast the next day, and glory be! Heaven! I had a peanut butter fudge cream pie. I’ve never tasted anything, and I mean anything, near as good. Ever. Ever. Ever! So I repeated the experience a few years later when I was back visiting my sisters in Mulvane. I’d had such a good experience before that I didn’t want to try anything new. I had the same thing, and once again, it was divine! This time, being six-months pregnant, I ate my pie right after dinner. I ordered the same thing again, and once again, I really did think I’d died and gone to heaven. Glorious was my experience, so wonderful, in fact, that I’m wanting to visit my sisters again this summer and perhaps stay at a B&B right by the restaurant. The only disappointing thing is that the restaurant has gone far more English since the first time I visited. There was one Amish girl my second time around. Everyone else I saw that worked there was English. Not that I’m trying to be touristy. I’m rather conservative in dress, and it’s the one place I can go where I can feel like someone else is kinda like me. Also, their gift shop is full of foreign imports. That’s just disappointing. It’s a great avenue for handmade items to earn extra cash and give the buyer something authentically Amish, authentically hand made, and authentically American. Pie for breakfast sounds like a good idea to me. Nice that the pie was consistently good years later. Actually, I’ve had three experiences. I live in southern Colorado, about an hour from Westcliffe. We visited the Amish bakery there. I couldn’t go in, as I was in a wheelchair at the time after having ankle surgery, and Westcliffe is very unfriendly to the wheelchair bound. My husband went inside and ordered me a brownie with chocolate chunks. It was good, but I wouldn’t say it was a divine experience. I was intrigued, on reading “Lydia’s Charm” (Wanda Brunstetter), by the above recipe – only problem is that you’d have to try it with a bunch of like-minded people. I don’t want to reproduce copyright material, but you can find the recipe by entering “Lydia’s Charm Frogmore” in the Google Books browser – the second reference given is the one that describes a family using the recipe. My Mom wasn’t Amish, but had some Pennsylvania Dutch ancestry, and she made the BEST chicken and noodles. And beef and noodles, and pork and noodles, too! As a child my parents made these and helped us make our own on different outings, camping trips, family picnics etc, my favorite was when we cooked onions and potatoes in hot oil first and then piled them on the bread, closed it and toasted it together…. still makes me hungry! We made these too, but we called them pudgy pies. This brings back memories of camping when I was younger. I seem to be very windy today. I guess Erik hit upon a topic that is near and dear to my heart. Food!!! We also call the “mountain pies” pudgy pies in WI. We have the same long handled folding griddles and we make them a lot, even now that the children are grown. They start up a fire in the backyard and stop at the gas station for the cheap fluffy white bread. Not only do they do the cheese/meat savory ones but they also do choc and marshmallow or peanut butter and jelly etc type sweet ones. We can also make them inside in our wood stove if we want. I love Amish Noodles! Either using a whole chicken and broth that has cooked all day in a crockpot or the quick way, canned broth, bouillion on the stove…then served over mashed potatoes! the ultimate comfort food! Good call Kelley. I like your screen name, and by the way, there is actually one thing Amish in California–furniture 🙂 I just got done revising our California Amish furniture guide, a few years ago I could only find 7 stores, this time I found around 20 across the state. Thanks for the info! I looked up your guide and Barn Furniture Mart in Van Nuys is the closest to me at 64 miles away! I live in Lancaster CA, (I wish I lived in Lancaster PA! LOL!!) I will definitely pay them a visit the next time I go “down below”! Sure thing Kelley, there are some in L.A. area as well but that’s probably not any better for you. Nice to hear from the “other” Lancaster. Actually I was curious and checked and there are a couple of dozen Lancasters across the US, though, according to Wikipedia, yours is the largest of them all. Yes, Lancaster Ca is quite large, however where I actually live is in an unincorporated part of Lancaster called “lake Los Angeles”, which is a small town about 25 miles east of Lancaster. Technically we are considered Lancaster but are actually in a rural area with about 12,000 people. Oh, and there is no longer a lake! Sorry to stray off the topic of food!!! 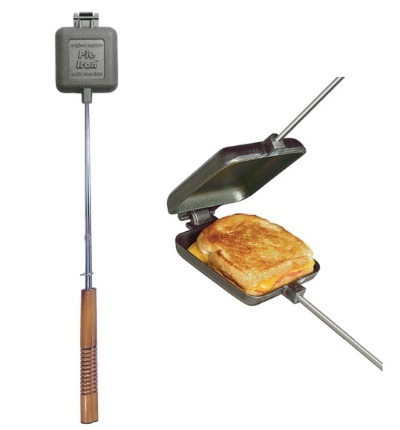 The last tool for making grilled sandwiches is not new to me. I have seen them in camping stores for years. Nothing like a grilled sandwich over the open fire after a day of hiking. As for shoofly pie, I have never tried it because I have been told by others who have that it is very sweet. I also read an Amish recipe for it and just reading the ingredients made my teeth hurt. I love fried cornmeal mush with tomato gravy. My mom always made tomato gravy to pour over meatloaf. I am officially hungry now. I live in Ohio and love to go to Mrs. Yoder’s Kitchen in Mt. Hope. Their food is wonderful and it is homemade. Everyone says that’s where the Amish go to eat. That’s true too, because there’s always a lot of Amish folks there eating! As far as the sandwich maker goes, we always called them “Hobo Pies”. Besides savory sandwiches, we also would put pie filling in them, bake over a fire and sprinkle them with powdered sugar. I’ve seen them for sale at Lehmann’s in Wilmot, OH. The makers that is. Debbie Shoofly is pretty sweet but I’d say it’s dry surface is tougher to deal with without splashing some milk on it. I imagine it might also go well warmed up with vanilla ice cream though I’ve never tried that. Many years ago when I lived in PA I bought a bag of noodles from an Amish lady, but when I went home to make a pot of soup the noodles were moldy. There wasn’t anything I could do that day, since the Amish were only at that particular site on Tuesdays, so I froze them. The next week I returned them and was given a huge apology and a fresh bag of noodles. Apparently they hadn’t let them dry thoroughly before packaging them. The other disappointment I had was a cherry pie that was all filler and no cherries. Don’t get me wrong I love the Amish and their baked goods. I have never tried Snitz pie and only had a Whoopie Pie once and I agree with you that after the second bite it was much too sweet. I didn’t waste it though, I cut the remainder in thirds and wrapped them to have at 3 different times. Their rhubarb pie is to die for and a friend of mine swears by the peach pies. Living in Texas now I am not near any Amish so I haven’t had any treats for several years. The Amish in Holmes County, Ohio make ground cherry pie, something I’ve not found anywhere else. They are only available in late summer, although I suppose one could put up ground cherries for canned pie filling. The ground cherry is a low-growing plant, and the fruit is yellow, about the size of cherry (hence the name), and encased in a papery hull similar to a tomatillo. They have a unique flavor, somewhat resembling a cross between a strawberry, a tomato, and a pineapple. Where did you find Ground Cherry Pie? I go to Holmes Co. A lot and would really like to try this kind of pie! Could you please tell me where I can find it there? Where do you find Ground Cherry Pie? Sherry, I have gotten it at Boyd & Wurthmann restaurant in Berlin. If you go in August you should find it on the menu. In fact, they usually offer at least ten or more different kinds of pie to choose from, so the dilemma is deciding which one to get. You can also buy a whole pie to go. Black raspberry is my other favorite! Thanks for the info Ken! I will definately go there. My favorite also is black raspberry. I make that myself and cobbler! Yum!!! Now I’m hungry, hahaha! An old neighbor of ours had ground cherries in the garden. I had never heard of them before, so I was intrigued by that crazy looking fruit! The neighbor lady didn’t make pie, but she made sauce, canned it and they ate it at breakfast time. For the life of me I can’t remember if I liked it or not! What I do remember is she put lemon slices in the sauce. I love Apple pie made with Apple Pie Spice I bought last fall in Sugar Creek Ohio. Gives the pie a different taste and smells very nice when it’s baking. Like frozen Peanut Butter pie that I got from an Amish cook book . Easy to make and stores nicely in the freezer until you’re ready to serve it. Also I have a recipe that I got from a writer of Amish fiction on her Facebook page. Very good. Hearty Chicken and Rice Soup. Best chicken soup I’ve ever tasted . I LOVE wet-bottom shoo fly pie. I like it warmed up with a little Reddi Whip. In fact I need to make a trip to Lancaster to get a pie from my favorite bakery across from the Bird-in-hand Farmers Market. When I was in Berlin, Ohio I purchased some of the peanut butter spread in a squeeze bottle made by Amish Wedding Foods. Delicious!! I had the tastiest strawberry rhubarb pie at Das Essenhaus. I don’t know who bakes them at their restaurant, but it was the perfect “sweet/sour” filling in a wonderful crust. M-m-m-m-m! Most of the rest on YOUR list, Erik, are big “no-nos” for me. However, I make my own (round) version of mountain pies on my kitchen (gas) range. I do a lower calorie version of my favorite restaurant sandwich (Monte Cristo—made with sweet French toast, turkey, ham & swiss cheese). I use Splenda in the toast, and don’t pile the meat very high. I use round “sandwich rounds” (bread) which fit perfectly in my round pie iron (which I spray with Pam). Holding each side over medium heat about a minute – 90 seconds is usually just enough to melt the cheese and warm the rest of it. M-m-m-m! That sandwich sounds unique (French toast) and really good Alice Mary. I’m a fan of mixing sweet and salty. 5 favorites..can there be? Fried or runion chicken, strawberry rhubarb fry pies, poor man’steak, peanut butter and apple butter spread, peanut butter pie, homemade wheat bread, cashew crunch, broccoli/cauliflower salad, potato salad. An Amish friend and I have had a conversation about all the sugar that is in their diet. When you don’t go to the grocery store as often as us English do picking up fresh fruits and veggies, I can understand why. I do have Amish friends that go to the grocery store weekly, but they are the only ones I know of that do that. Instead of running to the store you run to the cellar and bring up some canned fruits to make a treat. Fresh comes from the garden and then harvest time…so they wait. When you have 12 children how long would a bunch of banana’s last? Ha! My mother would be 97 this year and had an orange once a year and it was at Christmas! Our culture’s diet was similar to an Amish one in the “olden days.” You didn’t waste money that you didn’t have running to the store ALL the time as many do today! I don’t have any bananas in the house so I guess I’ll bake cookies! I love shoofly pie. Wasn’t certain when I bought the first one, but the lady said it’s best with a cup of coffee. Guess she and I are both coffee drinkers. So far, I’ve never had a shoofly pie I didn’t like, but I never had one with chocolate in it. The chocolate, at least in the one I had, wasn’t bad–a layer tucked in towards the bottom. It was still shoofly though–I think I’d rather either go full shoofly or full chocolate. But if you like shoofly, possibly an interesting variation for you. There is a medium sized congregation of Dunkard Brethren in the Banning/Beaumont area and an even larger community of German Baptists in the Modesto area. They are plain churches though not Amish. Thanks for the information, Beaumont is not too far from me so I am surprised that I have never heard of the “Dunkard Brethren”. I have heard of the Old German Baptists but was unaware that there were any in California! If you’re interested, Google Dunkard Brethren they have a website. I remembered growing up about the different kind of foods my family made compared to my friends family. I remembered the Fried sandwich maker the most because we used it a lot and even us kids could make fried PB&J sandwiches. For breakfast my mom would make a breakfast casserole, it would call for eggs, pork sausage, cheese on a crescent roll bottom layer bake it and serve with ketchup or white gravy. My favorite pie growing up also was the Strawberry/Rhubarb pie. My family never threw out anything ,like left over rolls , my mother would cut in half and refry them up on a griddle and served with warm Maple Syrup. I always liked that better than my friend mom pancakes. The church my husband went to for a large part of his childhood and his teens had a lot of what he refers to as ‘Amish Mennonites’ – culturally Swiss Menonnite or Pennsylvania German folks who split from the Amish when the Amish started to get really conservative. His favourites are “funeral mustard” (a cooked mustard which bears some resemblance to a custard – the family called it funeral mustard because the church ladies always made it for funerals). And tomato butter. We’ve started making it ourselves, from a cookbook of Pennsylvania German recipes. I wonder, do Amish actually make the “Amish Friendship Bread” that periodically makes the rounds? People give you a yeast culture with the instructions of how to feed the culture for ten days or so, then you’re supposed to divide the culture to give some to friends, keep some for yourself, and use some into a sweet cinnamon cake. Like all pyramid schemes, by the time you get recruited by a friend or relative, the market is already saturated and you have a hard time giving away your share! It’s tasty stuff, but you can make it with any sourdough culture; there’s nothing magic about the culture making the rounds. And I’ve always wondered if it even came from the Amish in the first place! Well, you’re looking at a guy that thinks that Amish baked goods should be it’s own food-group — the foundational (and largest) group of the food pyramid. I don’t have enough experience of eating with the Amish on a typical meal, so I don’t know which of the tasty morsels at the Amish bakery are normal Amish daily fare, but if being made in an Amish establishment is good enough to qualify it as Amish food, then most anything in the Amish bakery is high on my fav list. I also am a fan of the Amish produced jams and jellies, and honey. In fact, I’m developing a hankerin’ for some of Miller’s honey dripping off of a flour tortilla as I type this out. I’m not sure if beverages belong in your food list, but while in PA I noticed a lot of Amish homemade rootbeer sold from roadside stands. (Don’t recall seeing it anywhere else.) It wouldn’t make my favorite list, but it is an interesting taste from time to time. But my all-time favorite Amish food is likely not actually Amish — although it is made in the Amish country of Holmes Co. OH. It is the divinely inspired Amish Butter Cheese. I’m convinced that angels in heaven cry in envy when they see us eating this Guggisberg version of sliceable paradise. Thank you, Don, for telling us about Amish Butter Cheese. Because of your comment, I bought some, and it is wonderful! It’s similar to the Havarti Cheese I like. Alright, I am stepping out from the pack a little bit. Yes, I love the Amish baked goods but there is something about the potato salad that they make that is awesome. Yes, I know there must be a dozen or 3 potato salad recipes that they use and no, I don’t know which one I had, but boy was it good! Shoofly pie, if “wet bottom” is pretty good. One summer, I made shoofly pies for every potluck we went to – I was so sick of them by the end of that summer, it took a LONG time for me to find them appetizing again! Tomato gravy – YUM! – we always just ate our’s over bread. My mom, who was not into cooking and baking at all, used to make tomato jam – it was my favorite treat on bread. She’s been gone several years now, so I bought some tomato jam from an Amish stand at Central Market in Lancaster – it was horrible – ended up throwing it out. Don’t know if I’ll ever taste the good version again – sigh. Lemon Sponge Pie and Montgomery Pie are two favorite pies – I agree with you, Erik, all pies are good! Chicken Corn Soup is the best soup. Chicken Pot Pie (boiled, not baked) is also a staple around here in York County. I could go on and on, but this list would go on forever!